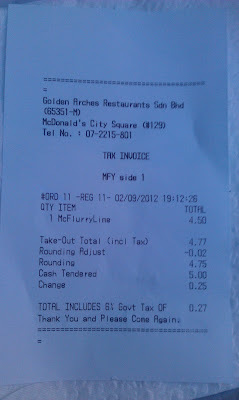 The photos from this little McFlurry were buried away on my hard drive and nearly forgot about it. 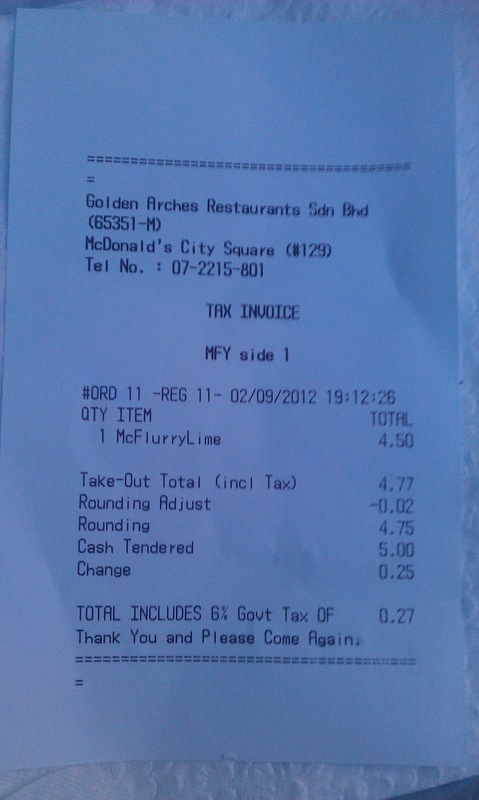 I had this the same day I tried the Corn Flakes McFlurry. I actually tried to order them at the same time, but the dessert kiosk was out of the Lime syrup, so I had to go stand in the regular queue all over again to get it. I almost didn't try it, since I had the Double Lime Sundae in Singapore a year before, but I'm glad I did, because it wasn't exactly the same. 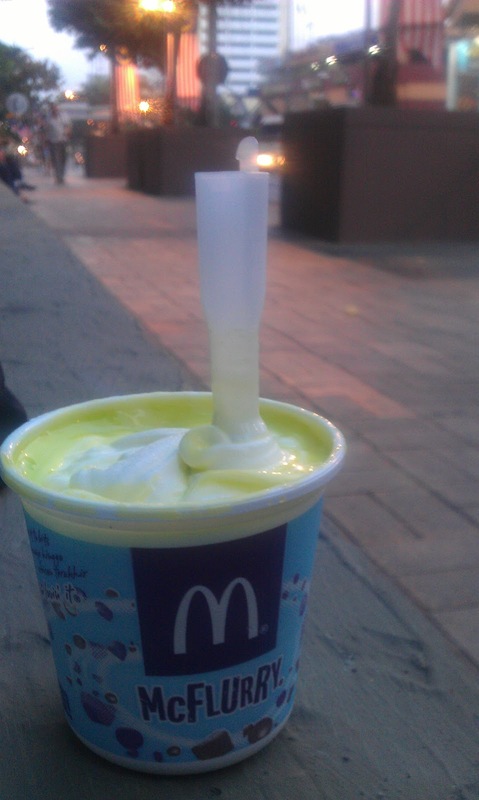 As I tried the Corn Flakes McFlurry in the comfortable air conditioned restaurant, I didn't want the other diners to see the only white guy finish one ice cream (after photographing it), and immediately go back and order another, so I took this one outside to eat. It was a hot and smoggy day, so my photos didn't turn out that well, but this was noticeably not the same 'lime' as I had in Singapore. 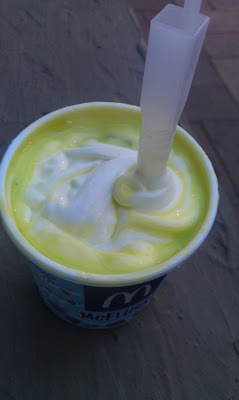 Whereas the previous one was a dark green, the lime syrup they used in Malaysia was a glowing, almost radioactive green. They were a little skimpy with the amount of sauce, which made me miss the guy at the dessert kiosk (no doubt the reason he was out of lime topping). I gave the Singapore Lime Sundae a 5/5, but this had a strong, tart artificial lime taste which was acceptable, but it just wasn't the best flavour, and it didn't make me want more. Also, the Sundae had large, tasty pieces of 'Nata de Coco' (which I talked about in the sundae review) but on this McFlurry, there were there, but they were tiny pieces rather than the large chunks. I finished a few mouthfuls to be sure, and once I made my way through the top layer of flavouring, I gave the rest of the ice cream a pass.